Cupcakes 'n Daisies: Twofer . . .
Twofer - something that satisfies two needs or criteria simultaneously. I have the need to blog about two subjects but the time to create one post, it's bargain day at Cupcakes n Daisies! First up, my living room wall hanging update. I've been hanging quilts on this rack in my living room for over a year now. I went back and read my post about the first quilt I hung after" Oh Christmas Tree", the quilt that motivated me to use that blank wall for displaying my quilts. This time last year I hung "Father's Fancy" and wrote that I wasn't sure I would be hanging any more! Boy I'm glad I got over that idea, I've hung and enjoyed quilts this past year that would have probably never got off a quilt rack or out of the closet. This is Lifetime Quilt Number 30, named Clara's Enchanted Nutcracker Dance. (click here to read all about it) I've made nearly 50 quilts since I pieced this quilt! I love it, yet I've never displayed it, until now. Technically it's a Christmas quilt, made from a Christmas family of fabric. But the print isn't overly Christmas and the colors match my living room perfectly. I plan to enjoy this quilt, for the first time really, for the month of January. Its sister quilt, Lifetime Quilt Number 29 named Snowbird Migration, is currently on my bed. The blocks were from Patchwork Party 2007. I made two sets of blocks then went with two different finishing patterns. My original idea was to hang the smaller quilt on the wall in my bedroom, but I don't have a wall big enough to hang it, so I've used the large quilt but have not done much with the the wall hanging until now. It's great to be enjoying both quilts. For a peak at another finishing option for these blocks check out Judi's latest finish (click here). Someone else is enjoying their Patchwork Party 2007 quilt too. There sure are a plethora of Sew Alongs, Challenges and Block of the Months starting up. I'm tempted to join every one of them but you know how it goes, so many projects so little time. So I plan to follow several, like that Building Houses from Scraps Challenge, the Fat Quarter Shops latest Designer Mystery BOM, and this It Just Takes Two sew along. Good luck to everyone who is participating in all these wonderful online quilting bees, I'll love watching your progress. 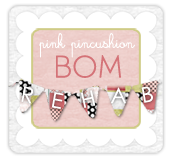 Another Year of Schnibbles, hosted by Sherri at A Quilting Life and Sinta at Pink Pincushion. I've had a few projects in past Schnibbles parades but hope to give it a better effort this year. Especially now that I have a perfect place to hang smaller quilts. The first project is Full House, a favorite pattern of mine. I plan to use Countdown to Christmas for my Full House, the perfect companion for my Starry Eyed quilt. I've also decided to participate in this Block of the Month. Memories of Provence by Monique Dillard for Open Gate Quilts. I picked this BOM because it's not a mystery, I not only love the fabric, it suits me and my house to a T, and I think the blocks look challenging, in a good sort of way. In addition to these two projects, finishing Evening Bloom, my needle turn applique project is a high priority for 2012. Other than that I don't have much in the way of plans and really haven't decided what I'm going to work on after I finish Starry Eyed and Full House. I'm sure something will call my name, but right now, I have no idea what it will be. When I do decide, you'll be the first to know! Your quilts are beautiful! Sounds like you are so pleased with your "display" wall...what a wonderful idea! I'll be seeing you in the Scnibbles parade...I'm just now putting together my little houses! Have fun with your Memories of Provence...very pretty! Love your Claras Enchanted Nutcracker Dance and glad to see it displayed on The Wall! I'm glad you decide to continue to hang your quilts too :) Loved your twofer post...I had to laugh though, because in my part of the country a twofer is case of 24 beer lol! I'm always amazed at how different settings can make the same blocks look totally different. It looks like you have a great year of quilting ahead of you. I can't wait to see all the wonderful quilts you create in 2012! It's great to see these quilts again. I love them both. Sounds like you have a lot of fun quilts planned for the new year. I signed up for the FQS BOM, too. I love the two quilts you've made (big and little!) and your plans for the year sounds great! I love how changing the quilts around the house really make such a change in the decor. Your quilts look great! 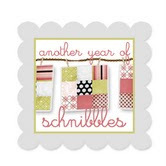 I am also joining in on the Schnibbles and I'm pondering the 2012 BOM at FQS the fabric collection is so tempting. I love all of your quilts and look forward to seeing your 2012 finishes. I am spending this year finishing UFOs from previous years, yes YEARS. Ugh. I'm doing the Schnibbles parade as well. I am trying to improve my piecing skills. Can't wait to see what fabric you choose. 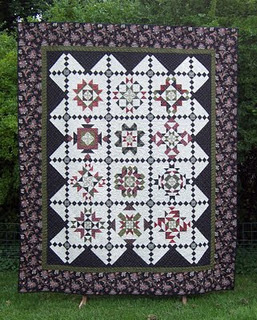 Doing some blog surfing tonight and I am in love with your quilts no. 29 and no. 30! Gorgeous! Where did you find the Monique Dillard BOM, or is it something that has already started and not available? I was thinking about the FQS BOM starting in June...I really like it too!